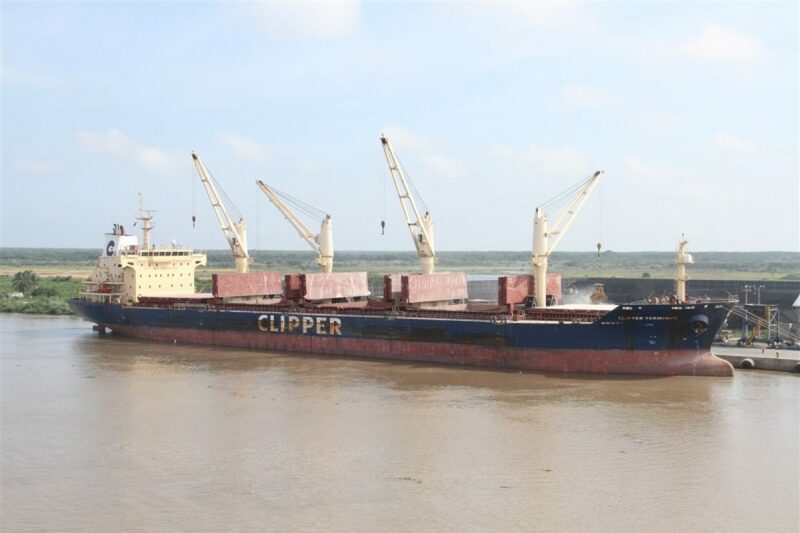 Bulk vessel “ CLIPPER TERMINUS “ called our port of Ponta Delgada for discharging 13.650,00 Tons of corn. This vessel has arrived at anchorage area of the port of Ponta Delgada on last Saturday 21.Jan.2017 early morning and has stayed at anchorage until 08:30 hours Sunday 22.Jan.2017, vessel berthed on this day..
Discharging operations only started on the 23.Jan.2017 at 08:20 hours and were completed on 25.Jan.2017 at 17:45 hours. During discharging operations there was several delays caused by heavy rain but even with these delays this vessel discharge was very fast. Vessel Captain was surprised with our work efficiency and also of Receivers and Stevedores. Vessel crew very well commanded, organised and professional, always very quick to reply to our requests in due time without causing any delays. All the parties have contributed for this call to be very successful.